Identical twins are the result of one fertilized egg splitting in two, resulting in two babies with the same DNA, according to the Healthy Children, an online resource published by the American Academy of Pediatrics. Having identical twins is an experience that not all parents can say they've had. However, raising identical twin boys or girls brings its own set of challenges, from dressing to making friends, so it pays for moms and dads to understand what they're up against in the 18 years to come. Clearly you won't be able to discern each twin's personality from the other as newborns, but you can foster a sense of individuality right from the start. There are many ways to make sure each of your twins understands that he is an individual person, separate from his twin. Stay away from names that have always gone together or those that rhyme. For example, don't name your twins Ron and Don, Bella and Stella or Braydon and Jaydon. Give your twins each a name that's separate from the other twin. This way they won't go through life as "one-half of the whole." Don't dress twins alike. It's fine to occasionally dress them in matching clothes; after all, that's part of the fun of having a set of twins. However, dressing your twins in matching outfits all the time just reinforces the idea that the two are one person. Once twins get older, give them a say in what they choose to wear. You'll probably be surprised at how different their styles are. Don't call them "the twins." This is just another way that twins get lumped into one person. Don't compare your twins. Each will like, and be good at, different things, so try to avoid comparing and contrasting their abilities and preferences. This will only serve to make them super competitive with one another, and foster sibling rivalry. Kids and mothers tend to thrive on a daily routine. However, sometimes the combination of exhaustion and the needs of two babies can make a mom forget who last ate, had a diaper change or even who had a bath last. To help keep your sanity and your baby's routine, stick a dry-erase board on the fridge and keep track of your daily routines. You might have identical twins, but you probably have two babies who don't have identical sleeping patterns. Write down when each twin naps. By recording their patterns, you can start to detect when you might be able to match their nap and bedtime schedules to each other, so both twins sleep at the same time. Write down when each twin falls asleep and how long they slumber. With time, you will notice each has distinct habits that you can use to form a meshed routine. The experts at Baby Center recommend keeping a feeding journal in which you record the time each twin eats and how much they each ate. This way, you know which twin to feed first next time and which one might need a bigger meal this time around. It's not unheard of for one baby to get changed twice and the other to go without a diaper change. In the early stages, it's a good idea to keep a diaper chart. Keep track of who was changed, when they were changed and the contents of each diaper. Twins so often get seen as 'one part of a whole,' that sometimes parents don't realize that they need to help their twins develop individual friendships. Parents may tend to think that each twin has their own built in friend, and while the twins may enjoy doing things together, it's also likely that they enjoy doing things separately too. It's important that as your twins grow, you actively develop their socialization opportunities. Consider the following, and talk to your children's doctor if you are concerned. Encourage your twins to spend time with individual friends by arranging play dates for one twin at a time. You can also take one twin to do a fun activity and leave the other at home, then switch next time. This helps twins learn to enjoy activities away from their identical sibling. Getting the twins interested and involved in separate activities can help them develop friendships with different people that have similar interests. This motivates each to find things he or she enjoys, even if his or her twin has different interest. Help your twins language develop separately from one another. Many twins develop their own unique way of communicating with each other that other people can't understand. You don't have to discourage this, but it's important to be sure each twin is developing individually too. Are your identical twins dependent on each other? If so, putting them in separate classrooms might not be a good idea. You want them to transition to school without a lot of stress and regression, so if your twins need each other, it's fine to start them out together. You may decide to separate them down the road, and that's fine too, once they're ready. Can they make friends away from one another? Identical twins who are comfortable meeting and making new friends might be fine in separate classrooms. This will help promote them to foster their own relationships and interests, regardless of what their twin is doing. Is one or both twins fearful in new situations? This can make separate classrooms even more difficult for your twins. The advantage of being a twin is that you have the other sibling to count on all the time, so if your twins are scared to start school, it might be a good idea to keep them together for the first few years. More than fifty percent of all twins are born prematurely, which poses a set of health risks that you may be dealing with times two. Additionally, both twins will likely share genetically related health issues. If one identical twin presents with a certain health condition, it pays to have the other twin tested and monitored for it as well. Most preemies require extended care after birth and may have to stay in the hospital until they grow, and can breathe and eat on their own. Even if both twins are born with the same problems, each will grow and develop at her own pace, and one may get to go home before the other. Because identical twins share the same DNA, if one has a purely genetic health problem, the other will too, according to experts at the National Human Genome Research Institute. This includes things like cystic fibrosis and sickle cell disease. 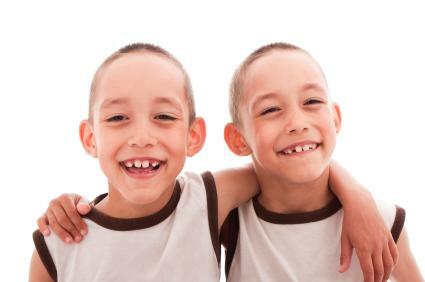 Some identical twins will wind up suffering the same diseases later in life too. If you have two identical babies, chances are you're going to get plenty of attention when you're out and about. You may or may not welcome the attention, but learning to respond to it is a part of living life with twins. Many people will ask you personal or inappropriate questions, and things can get awkward really quickly. If someone asks you something inappropriate, like if they were conceived naturally, you don't have to answer. It's okay to simply let the person know that you don't talk about it. Alternatively, you can answer with a quick yes or no, and move away signaling that the conversation is over. Sometimes, people will ask you which one is the evil twin, or the shy twin - as if they are opposites. Simply tell them that they are both angels, or both outgoing. Often, if you have other children that are with you, they can quickly feel left out. If the other children are old enough, consider letting them answer questions about the twins. This way, they can feel a part of the conversation rather than feel left out while all of the attention goes to the new babies. Post a sign on the front of each seat in your stroller to let people know it is not okay to touch the baby. This is especially important if your twins are premature, as keeping other people away will help protect your preemies from an onslaught of unwanted germs. Just like no two kids are alike, no two sets of identical twins, boys or girls, are alike. While reading through tips and advice about raising twins is a valuable way to get some good ideas, remember that you are the parent and you'll quickly find out what works best for your family. If you need support, consider joining Multiples of America (also known as the National Organization of Mothers of Twins Clubs). This is a great place to find other moms in your shoes who can answer questions, give advice and support you when the going gets rough. It's also the ideal place for sharing the unique joys your identical twins bring every day.